But, that’s just a guess. As Bridgewater did last year when it was needed, he simply lifted the entire Cardinal football team on his back on Keg o’ Nails Night, and carried it to victory. There really are few words to describe his gallant effort last night in Nippert without sounding as florid as a Nora Roberts romance novel. About midway through the 4th quarter, the Cards faced a fourth and 12 at the Cincy 38. On 1st down, freshman James Quick dropped a Teddy B pass, thrown while being hurried due to lack of protection. On second down, Keith Towbridge dropped another catch-able Bridgewater toss, again thrown while under pressure from Bearcat defenders. On third down, the Cardinal QB wasn’t even able to get the pass off and was sacked. On fourth down, facing a trip to Charlotte on 12/28 instead of Orlando — Hellllllllooooo Belk Bowl — facing a second disappointing, disheartening L in a season that was full of promise before its September kickoff, facing a Cincy pass rush that was heaping embarrassment by the play for U of L’s O Line, here’s what Bridgewater did.1 Sidestepped a tackler, avoiding a sack, broke free from another, skirted left end, then, when nearing the sideline, took a hit, turned backwards, stayed inbounds until he moon walked a new set of downs. I won’t attempt any more descriptors. The language would be too purple. Two plays later, on 3d and 8 at the Cincinnati 22, again hoping to avoid decapitation for lack of protection, Bridgewater hurled one while being battered to the turf. It looked targeted for the end zone . . . at Paul Brown Stadium miles away. Somehow it parachuted down in the vicinity of Damien Copeland in the far corner of the endzone — at soon to be refurbished Nippert — where he outfought a Bearcat defender for the go-ahead score. Then, on a put up or shut up defensive sequence, when Vance Bedford’s charges had the opportunity to make up for their late game no show against UCF after Bridgewater and the offense had regained the lead, the Cardinals’ defense shut up. Meltdowns ‘r’ Us. A toss from wounded, woozy and one-legged Brenden Kay to Louisvilian Mekale McKay for a 57 yard McDoubleKay gain, then a 15 yard run, both of which featured major defensive ineptitude, and Cincy was back on top, 21-17. I shall say no more about that punch in the face to Louisville’s Uncle Mo. Eleven plays later, four Teddy B completions later on four attempts, he connected on a fifth. To DeVante Parker, who was arm wrestling a Bearcat defender in the endzone, but still managed to grab and hold onto the perfectly targeted pass for another go-ahead TD. Okay, now some credit — Operative word: some — to Louisville’s defense. Final: Louisville 31, Cincinnati 24. Senorise Perry and Dominique Brown were bruised, battered but gutsy with 81 and 79 yards on the ground respectively. DeVante Parker had 9 catches, two TDs, thereby contributing mightily to the W. While also contributing mightily to the possibility/ probability that he might join his battery mate in the NFL draft. U of L’s sack savvy defense had a total of one (1) last night. It was obvious that Cardinal coaches didn’t trust the O line. Bridgewater was rolling out all night. Which is why he was only 23/37 with three TD passes. That series ended for the Cardinals when Teddy B was sacked on a third and 19 play. If you watched the game in the warmth and driitude of your den on ESPN, did you happen to see the scrawl that Jameis Winston was not charged with a crime? Bottom line. All’s well that ends as well as possible. Russell Athletic Bowl in Orlando in late December. Not bad at all. It could be a lot worse. Like Yankee Stadium for the Pinstripe or the Beef O’Brady’s thingamajig. 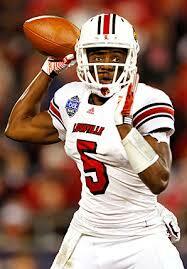 Teddy is the best football player while wearing a UofL uniform. 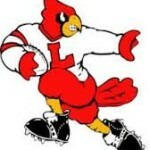 Johnny U was the best player who once wore a UofL uniform. You can’t comingle college and professional careers. They just aren’t the same. I should have added that Johnny U invented the two minute drill. And he played in the NFL when the offensive coordinator was the QB. Johnny U called most of his own plays and without the benefit of the view looking down from the press box. He set a record for consecutive games with touchdown passes that stood for years and years and years all the while playing with the older model ball that wasn’t as passer friendly, with DBs able to maul receivers without worrying about being flagged, with shots to the QB that make the UCF look tame. Unitas wasn’t much at UofL but in my mind he is still the best ever in the NFL. 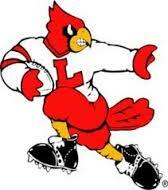 Lefors remains my favorite, but Teddy is the best to have worn the U of L uni. Even though word inside the coaching staff is that Teddy is seriously considering returning, he should move on. An encore season would not be a wise decision. Strike while the iron is hot, Teddy! You have no higher plateau that the one on which you stand. Tip of the hat to Coach Charlie Strong, who went for it, instead of punting, playing field position and wishin’ and hopin’ his inconsistent D would provide another chance for victory. Neither of which came on either of the two plays of that lightning Cincy drive to take the lead late. His coverage of McKay was high schoolish, and he blew a tackle on RD Abernathy’s TD scamper.